Here are a few business partners we rely on and can heartily recommend. Nationwide Strength, Local Expertise, and Friendly Service. I’m proud to represent First American Title and I am committed to provide you with superior service along with the very best products and services in the business. Please contact me today. Vicki sets the bar for the highest level of service. Her professionalism and kind hearted nature together create the ultimate business women. Vicki handles the toughest transactions with a big smile and no stress. Pam is not only a great Escrow Officer, her caring about the people involved in the transaction shows through. I recommend Pam and her team for anyone that wants to work with a person who truly looks out for their best interests. Kathy Rosales Your Hawaii Mortgage Broker 808-250-7077 Kathy decided to live in Hawaii when she was in third grade upon seeing her first school film about Hawaii’s natural unspoiled beauty and the ocean life. Byron prides himself on providing excellent service and matching customers to the appropriate loan program. And, when he isn’t busy helping others realize the dream of home ownership, he can be found enjoying his favorite pastime, paddle boarding. Looking for SERVICE? Call Fran. Serving all of Maui and Hawaii’s Mortgage Needs… Maui has a uniqueness all its own which is one of its many attractions. Not only do we have some of the largest varieties of weather on one island, but our properties have some qualities that are unusual to mainland lenders. Therefore, most Realtors recommend that you work with someone who knows the properties and who has the loan programs to fit that unique quality of Maui’s properties. Fran Peart Mitsumura and her team have been financing Maui properties for over 34 years. They know the unique properties, they know the loan programs, and they know how to fit those programs to meet your goals now and in the years to come. Fran was chosen for the “Affiliate of the Year” award by Maui’s Realtors Association and was a runner-up for the County of Maui’s Small Business Person Award. She is very involved with the community and donates to assist Maui’s non-profit organizations on a continual basis. Fran is known to make sure you get “the straight scoop”. First Hawaiian Mortgage has closed thousands of loans on Maui for local residents, mainland, and international borrowers. We use a unique “team” approach in our office so you can talk to all of our staff, at all times, and they will be familiar with your transaction at every stage. From First Time Homebuyers to the Seasoned Investor, First Hawaiian Mortgage is sure to have the products you need. Steven has closed over 1,200 Hawaii home loans and inaugurated the practice of always being readily available to his clients, serving them with the highest level of expertise. 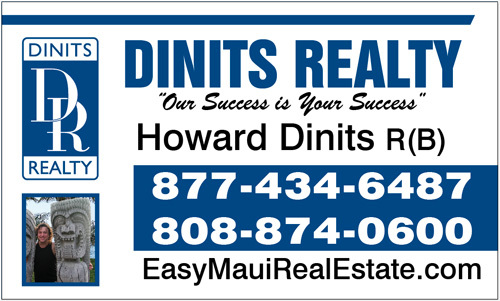 He maintains his NMLS (Nationwide Mortgage Licensing System) license which requires rigorous testing in addition to background and credit checks, as well as remaining an active member of both the National Association of Mortgage Brokers (NAMB) and the Hawaii Association of Mortgage Brokers (HAMB). With the goal of giving the lending industry the tools, skills, and vision it needs to excel in an ever-changing market place, Steven stands out in Hawaii as a true industry leader. The INSPECTOR will inspect the major structural and electrical / mechanical components for visual evidence of material defects and this report is not a statement of the code or permit complying condition of the property . Akamai Pest provides a non-toxic approach to ridding your home of termites. Bowman Termite & Pest Management is a family run business that serves certain areas of the islands of Maui, Hawaii, and Oahu. The owners, Bruce and Evelyn Bowman, have over 35 years of experience in the pest control and termite removal industry.